I’m sure they’ve tested this and have sound data to back up the decision to roll it out, but I’m not a fan. IMHO the page was already beautifully simple. I’m sure we’ll get used to it, but the fade in effect feels distracting. It doesn’t sound like this was a “knock it out of the park” obvious change. I find in most situations I’ll have my hand on the mouse directly before reaching Google (e.g. I clicked it my bookmarks bar). The act of taking my hand off the mouse to type moves it fractionally, but enough to invoke the fade-in. So I find that I don’t really get any of the benefit, just the annoyance of seeing the fade every time. the first couple of times I was left scratching my head at what exactly was going on. I’m more of a keyboard guy, so I was left wondering where the links had all gone. Thanks for pointing out that blog post. The reduction in noise is quite dramatic – and when you start conditioning yourself to it, the fade-in version actually looks quite busy. 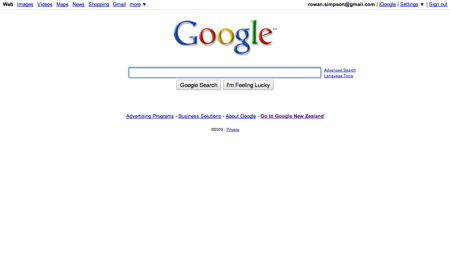 How funny to be saying that about the Google homepage! However, you really do have to use the page the way it’s asking you to use it in order to get the benefit out of it. 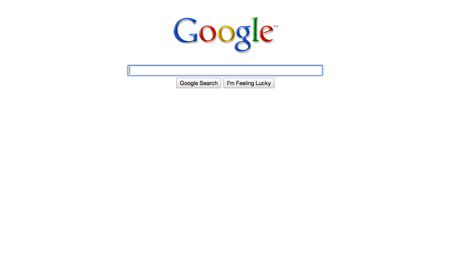 Its been a while since I’ve gone to the google homepage to type in a search request. Most people at my place just type straight into the address bar. Are there any browsers left that don’t make that a default provider search? At first I found it distracting but now I don’t seem to really notice it.